Campus happenings is a weekly email sent to those that subscribe to receive the latest updates about the Ashland University community and last minute event announcements. Email Commuter Services at commuter@ashland.edu with "Campus Happenings" in the subject line to be added to the listserve. Register for a commuter locker for FREE in the Commuter Services Office located on the second floor of the Hawkins-Conard Student Center (HCSC), Suite 232. Commuter lockers are located on the second floor of the Student Center. You will need to provide your own lock. For more information, email commuter@ashland.edu or visit us in the Hawkins-Conard Student Center, Suite 232. 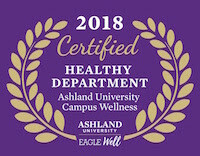 A student, while in attendance at Ashland University, is living in the permanent primary residence of his/her parents or guardian within 35 driving miles of Ashland University’s main campus (401 College Avenue, Ashland, Ohio 44805) or the Dwight Schar College of Nursing (1020 S. Trimble Road, Mansfield, Ohio 44906), Mansfield Campus for the upper-class College of Nursing students. A student is married, divorced, or widowed. A student has a dependent child. A student is 22 years of age or older prior to October 1st of that academic year. A student has served in the Armed Forces and received an honorable discharge. A student has lived in campus housing the equivalent of 8 fall and spring semesters enrolled in academic coursework each semester. A student is the holder of a baccalaureate degree from an accredited four year college/university. A new transfer student who has completed four semesters and a minimum of 45 credits from an accredited college/university. Approval to live off campus is given through the Office of Residence Life for up to one academic year. Once granted, permission to live off campus is only valid so long as the reason for the original approval still exists. Any change of status, during the period of off campus approval, may nullify the off campus status, thus requiring the student to be invoiced for room and board and/or possible conduct action. Students seeking approval to live off campus must submit/resubmit an application by May 1st for returning students, and prior to the start of the academic year in which they intend to reside off campus for new and transfer students. Students that have signed a housing agreement and are later granted off-campus residency are subject to a $500 termination fee (see housing agreement). The student’s local address and phone number must be maintained through the Office of Residence Life in order for off campus approval to remain valid. Any student who does not provide an accurate address and phone number by July 1st prior to the academic year will be charged for room and board. University conduct can be processed for off campus students who disrupt the lives of their neighborhood members (noise and disruption, alcohol, etc.). Commuter status can be rescinded in such situations. Students seeking approval to live off campus must submit/resubmit an application by May 1st for returning students and prior to the start of the academic year in which they intend to reside off campus for new and transfer students. Applications are loacted at housing.ashland.edu. Students must reapply each year to renew their eligibility. Students that have signed a housing agreement and are later granted off-campus residency are subject to a $500 housing cancellation fee (see Housing Agreement).